Curling wands are unbelievably flexible tools that can be used for a plethora of curly hairstyles. 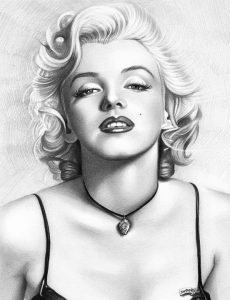 Giving a more natural-look than their predecessor the curling iron, curling wands are used all around the celebrity world. From Rachel McAdam's loose curls to Dita Von Teese's 1930's wave, curling wands can create stunning styles for all lengths and thicknesses of hair. Understanding the styles that suit your hair length will enable you to craft jaw-dropping curls, both tight and loose, and both up and down finishes. Easy to use, curling wands are an everyday tool that can help everyone get that glamorous curly look. Try Using a Heat Protective Spray. 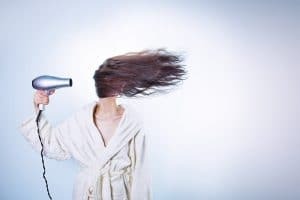 This is especially important for those with dry, fine, or damaged hair as heat can increase the brittleness, causing the hair to dry out and break off. Using a heat protector with keratin-based proteins will help to protect the hair from heat damage by shielding it with a protective layer. For ultra-damaged hair, try using a protector that doesn't include sulfates as these tend to dry out the hair more excessively. If your hair is damp, the high heat will cause the liquid in your hair to expand into gas, which will break out of the hair strands. This will cause the hair to shatter and break off. 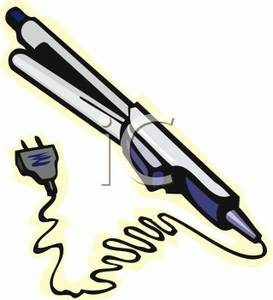 For people with damaged or fine hair, using a blow dryer coupled with a curling wand can accelerate further damage due to the double heat. Try to protect it by letting your hair completely air dry before applying the wand. If you use a curling wand regularly, it is important to follow a hair care routine that helps repair damage done by the extra heat. Try using hair care masks with argan oil, olive oil, honey and tea tree oil. Giving your hair oil baths will help retain and restore the moisture within each strand to gives a bit of extra protection from heat damage. This can be done by soaking your hair in your chosen oil overnight; coconut oil is phenomenal for this. When choosing a curling wand, make sure to pick one that has a ceramic column as this will protect your hair better. Tourmaline technology will also help to deionize your hair to lock in the moisture. If you have fine or dry hair, ceramic is essential as titanium will burn the hair. Take Care of your Hands and Face when Using a Curling Wand. Make sure that you use a glove so that your fingers are protected and take care to keep the wand away from your cheek and ears. If you do burn yourself, apply aloe vera directly to the burn. When you have finished with your wand, make sure to wipe it down. Using a damp cloth while the wand is still hot will help to easily remove any residue. When the wand is cold, wipe it down with alcohol to make sure that all residue and bacteria have been removed. Long hair is perfect for a curling wand as there are very few styling limitations. Noodle curls and corkscrew curls are tighter curls that are achieved with thinner curling wands. They give full volume to long hair, providing a sassy, fiery look. For a softer look, diamond waves or tousled waves are beautiful for long hair. They are created using bigger-barrelled curling wands and beaded curling wands. For long, layered hair, tighter curls will drop to more tousled curls over a couple of days due to the weight of the hair. This creates varying different looks without having to restyle it. Long hair can be pinned back from the face and tousled down the back to accentuate the layers, or the layers can be swept up into a series of vertical ponytails to give the impression of one extremely long tousled, curly ponytail. Alternately, pinning curls back or accessorizing with a headband can create Greek styles for long hair or beautiful wedding up-dos. By curling small strands of hair, up-dos can create more feminine charm with curls that frame the face, creating an air of softness. Curling wands can also create lift for the hair when crafting an up-style, giving the finished product more volume. Medium hair can be a little trickier to style when curly. Messy curls are the easiest way of curling medium hair, tousling the final product with a little hairspray to create looser curls that frame the face. For a more sleek and finished look for medium hair, you can try the wet effect. This is done by slicking mousse through the hair to give the impression of wet hair. This is best teamed with bigger curls on medium hair, as it creates a better jawline effect. Use a bigger-barrelled curling wand for this. To create more dynamic styles for medium hair, try variants on long-haired up-dos. A ponytail may be difficult and buns are near to impossible to achieve with medium length hair. However, a half ponytail can create different looks depending on the amount of hair pinned back. You can pin back the hair while keeping the parting in place, slicking the front back, or creating a quiff on top by back-combing the bangs. Alternately, taking only a small section of the front of the hair while leaving the rest down and curly gives a feminine and bright look that accentuates the eyes. While short hair is much more difficult to curl and style curly, there are some beautiful and creative short hair designs that showcase short curls. When you consider icons like Marilyn Monroe and Dita Von Teese, you can see the subtle 30's look that can be achieved with a curly bob. This is done by curling the hair and letting it cool, then combing through it with mousse to let the curls merge together and set. Very short pixie cuts look incredible with very tight curls, achieved with small-barrelled curling wands. While the sides may be too short, tight curls on the top of the head - usually in a side parting - give a cool, rock chick look. Curls that twist the same way give a more finished style while running mousse through the curled top will give a more wild, tousled edgy look. Chin-length bobs tend to work better with messy curls, tousled with sea salt sprays and hairspray. For short hairstyles with bangs, loose curls tend to soften the bangs, without creating too much of a contrast. California waves are a great example of this because they give the tousled feel without shortening the hair too much. However, without bangs corkscrew curls can give a very bouncy fun feel. When Is A Curling Wand Preferred Over Other Styling Tools? Curling wands are most often compared to curling irons. Curling irons have a clasp on them, which helps to give a more polished feel to the curls. This will create an overall finish similar to ringlets. Generally when using a curling iron, all the curls go in the same direction, giving a much less natural look than a curling wand. Curling wands give the final impression of hair that looks naturally curly. 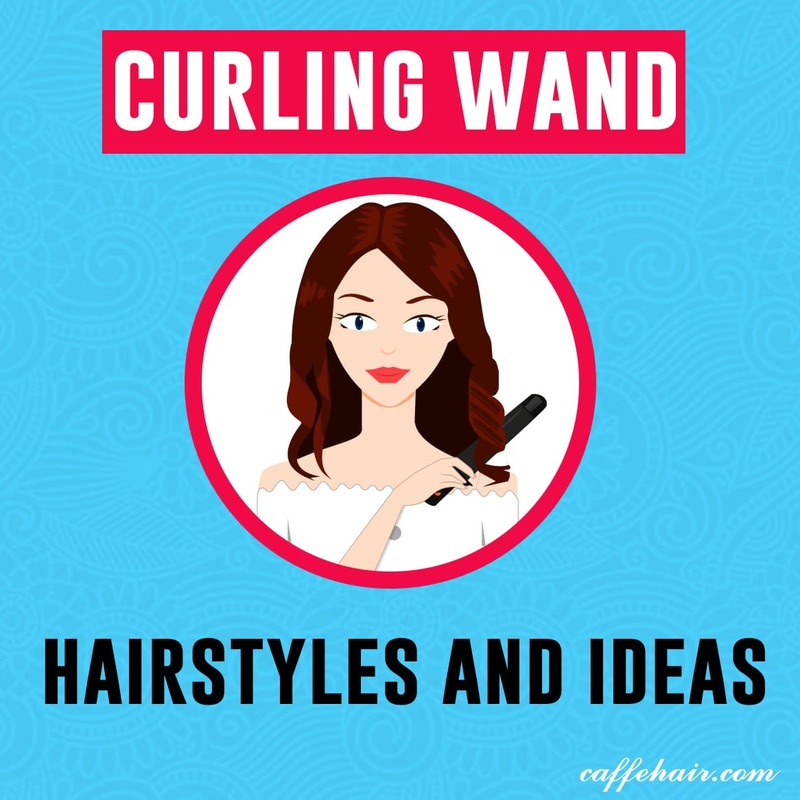 Not only do the curls go in different directions and come out in varying shapes and sizes, wands can also be used to craft various types of curls. 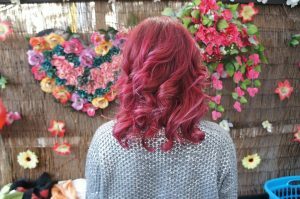 Whereas a curling iron is limited to ringlets, curling wands can do tight or loose curls, can create waves and can imitate varying textures of curls. This is because when twisting your hair around a curling wand, the hair twists itself, which creates a kidney-bean shape in its very twist. That’s the same shape as the follicle of a curly-haired person. Also, without a clasp of any sort the hair isn't flattened into a ribbon. When using a flat iron to curl hair, the curls end up having a very flat edge to them, similar to a ribbon. Some flat irons have a square edge which can give kinks to the curls, leaving the finished product feeling boxy. Flat irons will give pristine finished ringlets, but they do not have the same naturalness as curling wands. However, for beachy hair, using a flat iron and tousling your hair upside down with salt spray will give a lovely surfy feel. Curling wands are incredibly versatile tools that can create a myriad of different hairstyles. While everyone's hair is different, curling wands are able to give access to a variety of natural-looking curly hairstyles; relaxing the hair for some and twisting it deeper for others. It is important to care when using a curling wand to prevent your hair and skin from burning, especially those with damaged or fine hair. Take care to protect it with protective products and to follow a hair care routine that minimizes and repairs any heat damage.